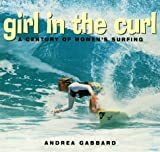 Girl in the Curl takes the reader on a journey through the history of women's surfing. The contributions that women made to this sport are both crucial and often overlooked. Page by page this book reveals the powerful impact surfing has had on women since the ancient Hawaiians took to the water, and started riding waves. With each chapter we are given a glimpse into the lives of legendary women surfers. Although their approach to surfing was rooted in different motivations; their passion for the ocean would unite them in a way that would otherwise not have been possible. Marge Calhoun didn't start surfing until she was married and had two daughters, but she was an experienced water-woman. Once she had discovered surfing, she saw her earlier life as a preparation of sorts, to this new way of life. She thought, as many do, that surfing not only keeps you fit physically, but mentally as well. She wasn't afraid to surf the big Hawaiian waves with the line-up dominated by men, for she was just as fearless, and just as talented. Her passion for the ocean was passed on to her daughters who followed her into the water like ducklings. Surfing in the fifties and sixties, Marge was a pioneer in surfing, not just women's surfing. Some approach this sport from a more competitive stance while others are simply soul surfers. Linda Benson and Joyce Hoffmann, for example, were both extremely athletic, competitive surfers of the late fifties. They took surfing to another level. Calhoun and her daughters made surfing more approachable for women of all ages. Linda started surfing more aggressively, and Joyce would try to surf exactly like the guys. Margo Oberg, another champion, would prove the longevity of one's surfing career by surfing professionally for more than three decades. Many of these women are in their seventies, and are still surfing today. Surfing, once discovered, becomes a way of life. We are taken through the lives of soul surfers such a Shelley Merrick, and Rell Sunn. One can't help but become infected with the spirit of Aloha when reading about Rell's influence on young surfers, and her role in the Surf Rider Foundation. Surfing provided her therapy when battling for years against breast cancer. Her death was felt throughout the surf community, and surfers from all over the world flocked to Hawaii to pay their respects in January of 1998. There is also the new generation of surfers such as Lisa Anderson, and Serena Brook making their mark, surfing just as good as the men; but unfortunately not getting quite as much prize money. Things are changing though, and these past few years have shown a resurgence in surfing, and especially women's surfing. Throughout the book are beautiful images of waves from around the world, works of art in their own right. From vintage shots taken in the fifties, to those taken by cutting edge underwater cameras, we can see how surfing has evolved. Not only is this book interesting because those written about are quite unique; but there are short essays by surfers about others surfers. Hearing all these different voices provides for a colorful journey, and can be enjoyed by surfer and non-surfer alike. Furthermore, there is a glossary of terms at the end to help those not familiar with surf lingo, as well as a list of women's surf organizations throughout the world. Courtney Young majored in Visual Arts at Dowling College, Long Island, NY. Surfing keeps her sane.